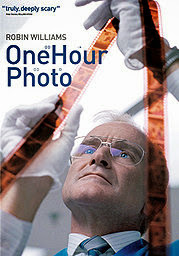 The Rockport Film Review: The Darker Side of Robin Williams "One Hour Photo"
The Darker Side of Robin Williams "One Hour Photo"
In a time not so long ago people use to take pictures with cameras that used film. You'd get about 24 shots per roll, they would have to bring it into a store to get it developed. Sy Parrish is a photo lab technician at a Wal-Mart like big box store called Sav-Mart. He takes his work very seriously as family photos are a treasured commodity that can't be replaced. He knows his customers well and closely follows the lives one family, in particular, the Yorkin's. Will (Michael Vartan), Nina (Connie Nielsen) and their son Jakob. He likes to think of himself as Uncle Sy while Jake calls him Sy the photo guy. It's all pretty normal and business as usual, but inside Sy is hurt and tortured soul. deep down you know something is bothering him. He's is not a bad person, he doesn't drink or get violent he is just damaged. Things start to get creepy when we see his living room wall covered with photos of the Yorkin's. He has made extra prints of all of his favorite moments in their lives. He fantasizes about living in their house and being loved as Uncle Sy. He purposely runs into Nina at the Mall's food court, then shows up at Jake's soccer game. He is desperate for a family, desperate for any real human connection. Sy's fantasy world is about to come crashing down as he discovers that Will is having an affair when he develops a young woman's film. He feels personally hurt and betrayed as Will has broken up his surrogate family. In retaliation he puts some of the incriminating photos into Nina's order an watches what happens. About the same time, the Sav-Mart manager has caught on to Sy's extra prints that he has been taking home and fires him on the spot. This is the last straw and Sy simmering anger and rage is about to be unleashed. He steals one last thing from Sav-Mart, a hunting knife, and heads out to teach Will a lesson. The film opens at a police station with Sy under arrest being asked questions by a detective. This is also where it ends as Sy breaks down and confesses what happened to him as a child. "One Hour Photo" is an intriguing and heartbreaking character study of a damaged man looking for the loving family he was denied of as a child. Robin's performance got huge praise and a few awards. That same year (2002) he played a murder suspect in the Christopher Nolan thriller "Insomnia". This will be the next review as we explore the darker side of Robin Williams.